Yum! Who can resist a rich, sweet, indulgent, creamy cheesecake? Pick the cheesecake that appeals to your sweet tooth the most, and see what it says about you. You are a genuine person and a true friend. You are very attentive and a good listener. At times, you can be a bit formal and polite. You don't want to step on any toes. You are also very logical and rational. You give good advice, and you are good at moderating arguments. You are a very harmonious person. You have a lot of joy in your life, and you spread it around in subtle ways. Last Week's Quiz - What Color Bug Are You? Art makes my heart sing. So do books, flowers, fruits on trees, flea markets, pretty things, Keanu Reeves and lots more. Did I say Keanu Reeves? Had the chance to watch '47 Ronin' twice a while back on HBO. A sad story but what a movie! But I digress, alright, back to art. 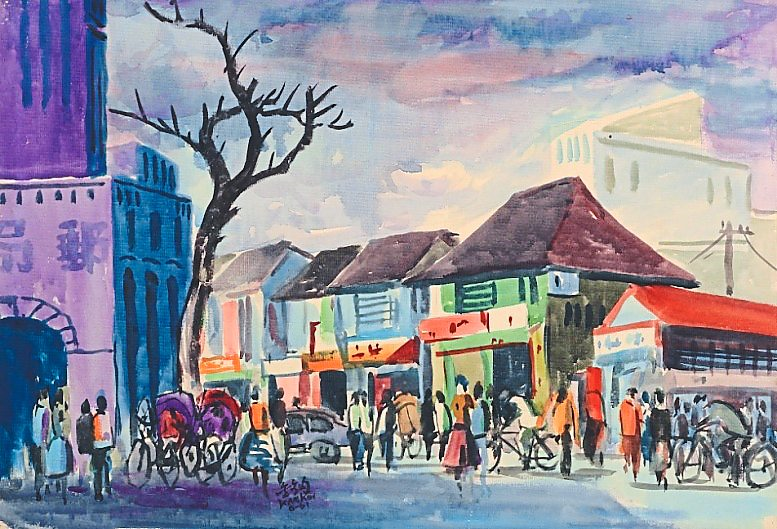 Here's a water colour piece the artist names it 'Taipei Street Scene and it was painted in 1961. 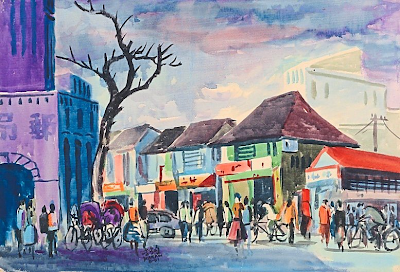 Hmm, 1961, Kuala Lumpur could look something like this too especially the row of shophouses synonymous with pre-war architecture in the east/far east. The artist of this attractive piece is Ipoh-born Dr Choong Kam Kow who is currently having an exhibition of over 260 works featuring 15 series created during the various stages of his 60-year career, it is a revelation of Choong’s life journey, starting from his early years as an art teacher at the Perak Girls’ High School until his battle with colon cancer in 2005. Cross Culture. Trans Era. will be on exhibition until March 31 at the National Visual Arts Gallery from 10am to 6pm, Mondays to Sundays. Friday Frolics - What Color Bug Are You? Time really flies, and you better believe it. It's Friday again and time for yet another round of Friday frolicking with a simple and fun personality quiz each week. Enjoy this week's quiz, it's about the Buggy. Take the quiz to find out what color Bug are you. Have fun! You are an imaginative and whimsical person. You're living on your own planet, and what a glorious planet it is! You have a totally magnetic personality, and you are definitely a bit of a flirt. You are playful and lighthearted. You try not to take life all that seriously. You are a big dreamer, and you're always thinking of new possibilities. However, you sometimes tend to have unrealistic expectations. Last Friday's Quiz: What Color Day Are You Having? This one is for school-leavers looking for some education funding. Right off The Star page..
Every year, The Star collaborates with the best educational institutions, both local and abroad, to award deserving students a chance to pursue a higher education. These scholarships cover a wide range of fields and disciplines, from entry-level courses to postgraduate education, professional studies to vocational training. The best thing is the scholarship are all bond-free. Applicants are encouraged to apply for admission into respective institutions separately. within two (2) weeks after the release of SPM or STPM results. Late applications will not be considered. Check out The Star for more colleges and other/further details. PUTRAJAYA: THIS year's Sijil Pelajaran Malaysia (SPM) results will be released on March 3, about two weeks earlier than the before. Second Education Minister Datuk Seri Idris Jusoh announced this yesterday after a meeting with several key stakeholders in private higher education. Friday Frolics - What Color Day Are You Having? 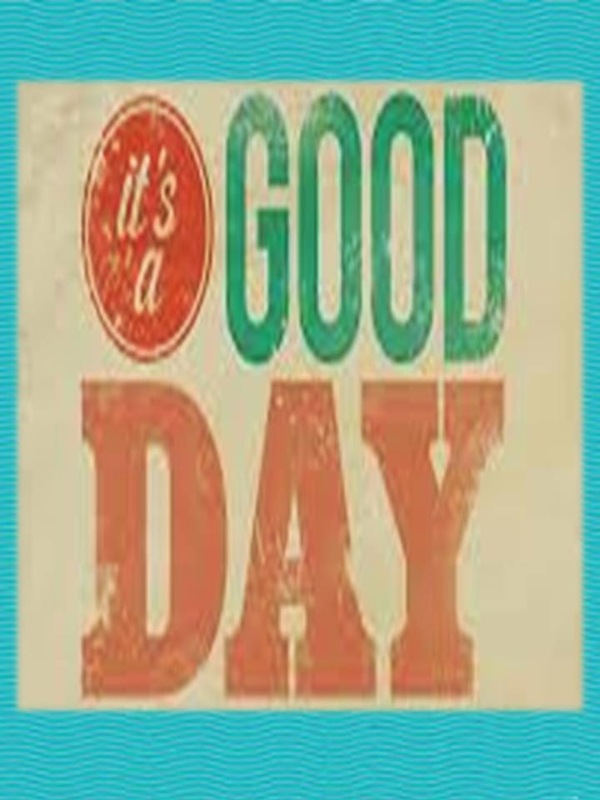 Want to know what your day is going to be like today? Take the quiz to find out. Happy Friday whatever it is! Looking at the orange reflection on the Petronas Twin Towers in the distance, Kuala Lumpur is set for yet another bright sunny day. Wherever you are, hope your weather is what you want it to be. Today you are your normal responsible, serious self. You're getting done what needs to be done. And you're not too worried about how you're feeling. While you're all business, you are still warm and approachable. You are busy, but you're not too busy for a little fun down time. What Color Day Are You Having? Last Week's Quiz: What's Your Introvert Strength? Bali was where a colleague escaped to for a good few days of R and R. She and her group stayed at the Hard Rock Hotel at the Kuta area. They were even taken by their guide to where the Bali bombing took place back in October 12, 2002. 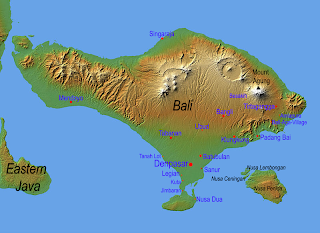 Today, Bali is back to her bubbling, busy self with tourists flocking back in droves for its relaxing and touristy atmosphere. She came home a happy camper, her biggest shopping haul being the five paintings that she bought at prices unheard of here in Malaysia. Cause for celebration for her, naturally. Only thing is she had to remove the paintings from the frames citing she won't be able to get them on board the plane. Pity. She brought back a lot of gifts for friends and family. 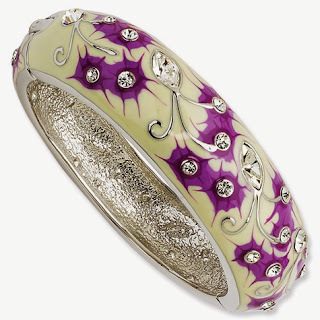 She gifted me with a carved wooden bangle. It's red, exactly what I was looking for. It looks quite like the one in the picture here. She has promised she'd invite us to her home once the paintings are up on the wall. Can't wait. Shopping Tip - If you are going to Bali, leave ample room in luggage for shopping. You won't regret it. Good day to start work..
We are just about five weeks to Chinese New Year and this is the time of year in which most working Chinese may want to check out what's the best day to start work in the new Lunar Year - perhaps, part out of curiosity, part wanting to be sure to start the year right and to schedule one's leave. Me included. So a search on good day to start work in the new year surprisingly yielded on top spot Steve Jobs commencement address at Stanford College. Strange! I've read this piece before but I couldn't pass up rereading it because I remember it as being very inspirational the first time I read it. So I reread this now-famous pitch. This was published nine years ago and I reproduce the beginning of it below. You can read the full text here: 'You've got to find what you love,' Jobs says on the Stanford site. Still wondering about how far off the search result was to a query that is so dissimilar to the result, I went back to the tab and found that I had made a typo actually. I mistakenly typed in 'good day to start work in 2005' instead of 2015. If I had correctly typed in '2015' the result would have been different. But, I must say, no regret about the typo. Call it serendipity? Oh by the way, if you are interested to know good day(s) to start work in the new lunar year, do check back. I've found a good site with the info. I just need to tweak it a little for better understanding. Friday Frolics - What's Your Introvert Strength? How time really flies. I just realised my last post was also a quiz, last Friday's frolic. Oops! Will have to do better. This week's quiz is also interesting. Find our what's your introvert strength if you haven't a clue already. Yeah, who does! The weather isn't pretty today - overcast. Don't leave home without it, the umbrella, that is. You have found a lot of meaning in your life... even if it seems very ordinary to outsiders. You have hidden well developed depths that others don't see right away. You are quite guided by philosophy, spirituality, or religion. There is usually a reason for doing everything that you do, and you understand why you get up in the morning. You are guided by your values, and you find that you often know what the right thing to do is. And you actually do it! Last Week's Quiz: What Part of a Pair of Jeans Are You? Friday Frolics - What Part of a Pair of Jeans Are You? You'll never look at jeans the same way again. Trust me! Take the quiz to find out what part of a pair of jeans you are, just for some Friday frolicking if nothing else. The sun is up here in Kuala Lumpur and floods are receding in the east coast. The big clean-up begins. The Met Dept says no heavy downpour expected going forward. But of course, the Chinese new year is only about seven weeks away (Thurs, Feb 19, to be exact) and that brings with it dry, hot, slightly windy weather - but then again wonderful weather for the celebration. In the meantime, Happy first Friday of the new year, everyone! You are a very easygoing person who just takes life as it comes. You are quite lighthearted. You are active and even spontaneous. You are up for almost anything, even on short notice. You are flexible and resourceful. You don't need much to be happy; you make do with what you have. You travel light through life. You aren't the type of person who collects stuff... or emotional baggage! Lots of Fun, Free Quizzes! Last Week's Fun Quiz: What Do Your Initials Say About You? A nice start for the new year, for Malaysians at least. 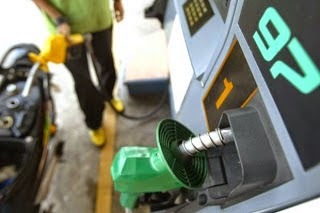 Prices for RON95 and RON97 petrol have come down by 35 cents per litre from Jan 1, while diesel is down by 30 sen.
RON 95 is now at RM1.91 a litre and RM2.11 for RON97. Diesel is at RM1.93. On Dec 1, 2014, retail prices for petrol and diesel were fixed on a managed float system, effectively marking the removal of all fuel subsidies. Under the managed float, retail prices would be based on the monthly average world price of crude oil. However, food prices are not expected to come down in tandem. On the contrary, my bowl of Chinese noodle soup cost me 50 sen more this morning.